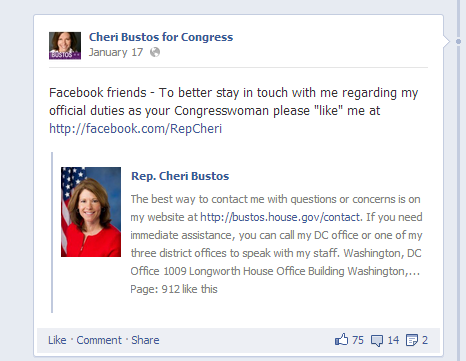 (Osco)- The Congressional service of Cheri Bustos has gotten off to a rocky and embarrassing start. to get her offices opened quickly in a geographically diverse spread throughout the district as promised. resources with publicly funded, and taxpayer paid resources, is strictly prohibited. Below is the letter that I wrote, with the attachment, to the House Office of Congressional Ethics. Date of Infraction: January 17, 2013 and for an undetrmined length of time thereafter. The House Committee on Ethics (“the Committee”) publicly released an important letter recently that represents a significant change in policy regarding political websites and social media. In sum, the Committee has realized that with the rise in the prominence of social media and the Internet, constituents are often sending messages to political websites and social media outlets with the intent of reaching a Member’s official site. Thus, it is now the policy of the Committee that Members’ campaign sites may provide a hyperlink to Members’ official websites IF that hyperlink is accompanied by a disclaimer that has been approved by the Committee on Ethics in advance. This also applies to a Member’s political Twitter and Facebook sites, and extends to any other social media outlets that campaigns may be using on the internet. Any sites without a disclaimer may not contain a hyperlink for, or reference at all, a Member’s official website. Please note that while linking to the official site from the political site is now permitted, the reverse – linking to a political site from the Member’s official site – is still strictly prohibited. Thank you for visiting my campaign (website/Twitter page/Facebook page). If your intention was to visit my official House of Representatives (website/Twitter page/Facebook page), please click here. Rep. Bustos had a direct link connecting her campaign Facebook page with her official, (and purportedly) taxpayer paid, web site and Facebook. That is strictly prohibited without the official, pre-approved disclaimer. (Please see attached letter on previous ruling). To the best of my ability all information has been obtained legally from materials in the public domain. I am a resident, voter, and taxpayer of the 17th Congressional District of Illinois and am a citizen desirious that the United States Constitution, the laws of the United States, and official rules of the United States House of Representatives are followed. I will send a hard copy of this complaint, with the signed statement of awareness of the “False Statements Act”, via postal mail out of the Osco IL Post Office, 61274 on 4/30/13. I ask this Honorable Committee to investigate this alleged violation and issue appropriate sanctions and penalties as the rules and law requires.